We love this seemingly easy to do clay pot DIY from Say Yes to Hoboken. What a fun way to get your hands dirty and add some handmade items to your home! Check out the blog for full DIY instructions and templates. Recently an email has been circulating that I think we should all know and share! Not only are plastic bottles the top land fill culprit, it has been discovered that they are very dangerous to our health: Plastic containers that are placed in freezing or hot places release highly carcinogenic toxin called dioxin that goes straight into the food and water that we consume. Dioxin chemical causes cancer, especially breast cancer. Dioxins are highly poisonous to cells in our bodies. Do not freeze plastic bottles with water in them or leave them in a hot car as this releases dioxins from the plastic. Do not microwave using plastic containers….. This especially applies to foods that contain fat. The combination of fat, high heat and plastic releases dioxin into the food. Use a stainless steel canteen or a glass bottle instead of plastic! Use glass, such as Pyrex or ceramiccontainers for heating food… You get the same result, but without the dioxin. So, such things as TV dinners, instant soups, etc., should be removed from their containers and heated in something else.. Plastic wrap, such as Cling film, is just as dangerous when placed over foods to be cooked in the microwave. As the food is nuked, the high heat causes poisonous toxins to actually melt out of the plastic wrap and drip into the food. Cover food with a paper towel instead. In honor of this important information, here are some of my favorite “safe” containers: I don’t go anywhere without my SIGG bottles. They travel well, are easy to clean with baking soda and come in many awesome designs that are updated yearly. These glass containers are oven and microwave safe (without the lid) and inexpensive at Crate and Barrel. We love giving new uses to our old stuff, especially when it turns out as trendy looking as these! 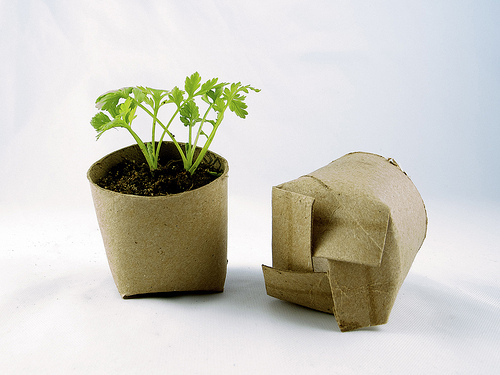 It’s a little late in the season to be planting but we love this idea from groovygreenlivin for repurposing toilet paper rolls into biodegradable plantable pots! Great ways to reuse a lightbulb! Check it out at apartmenttherapy These chandeliers from designsponge are eye-catching and look pretty simple to do! What is your favorite way to repurpose everyday items? In honour of the Queen’s Diamond Jubilee this week, our Friday Favourite are the delicious limited edition Laduree Macarons. We love the special packaging put together for the event. Come see us at the Summer Fancy Food Show! NASFT‘s Summer Fancy Food show is being held in Washington, DC June 17-19 and we will be there! Come by to say hi, browse our latest products and take home a reusable bag. We will be exhibiting under the Canadian Pavilion at booth #4935. Haven’t registered yet? Get $10 off your badge using the code SX6. We want to introduce a new fixture to the blog- Friday Favourite. Whether it’s a product, movie, music, etc we will be tuning you into what we are loving at the moment. Today, it is the Cuppow travel mug. Not only can you turn any canning jar into a spill-free travelling mug, but it is also BPA free and 100% recyclable- definitely something close to our hearts at Oasis Bags.